Winter is coming! This is a great time to think about the goals for your mudroom! This small space has to serve many functions. It is a place for your child to store their backpack, coat, and shoes when they walk through the door and a place for you to hang your keys and belongings so you do not loose them. Many mudrooms also function as a laundry space, only adding to the chaos. Since it does serve so many purposes, it is very important to consider the materials that will go into the development of the space. There is no reason that a mudroom cannot be stylish and welcoming. The right colors and hardware can make all of the difference in creating a space that functions exactly as it should. If you want your mudroom to be able to withstand shoe stains, mud, pets, and other clutter, you may want to find materials that are resistant to them. One thing to consider is built-ins for easy storage. Giving everything a space can help fight clutter. Hooks for backpacks and keys are helpful for keeping things off the floor. Shoe cubbies are a great way to invite guests and family to remove shoes and keep them out of the way. For more information about creating a well-functioning and welcoming mudroom space, click here! 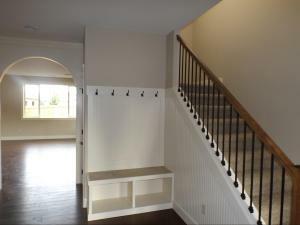 Click here to view our floor plans, to see how you can work all of your mudroom goals into your Custom Vancouver WA Home. Click here to contact our home builders today.